Truthfully, winter really snuck up on me this year. Usually, I’m well prepared for the onset of cold and flu season not only for the kids but for our whole family. 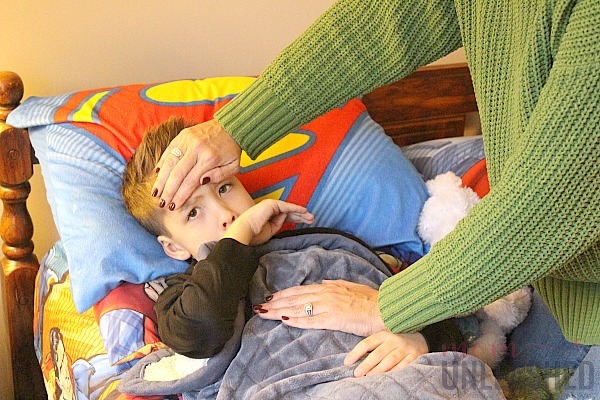 However, with the craziness of this year, I didn’t even start to think about the dreaded sicknesses that seem to invade my home every winter until my littlest came home with his first nasty cold. Those of you who have kiddos probably already know like I do that while they may not like to share their toys and belongings, there is nothing that kids love more than sharing their germs. This time of year, I’m never really surprised when one of my kids starts to sniff or gets that funny look about them that fevers bring on. Instead, I simply turn to my trusty medicine cabinet, put on my nurses hat and start working our way through cold and flu season the best way I know how. While I’m a firm believer that love and rest are amazing ways to treat the cold and flu, I also know that medicine can help alleviate symptoms and bring down fevers. However, I think it’s so important to not only know about the medications you are giving your child (and taking yourself for that matter) but to also know your child’s dose this cold and flu season and pay careful attention to what medications and how much of them you are administering. That’s why I put together some easy dos and don’ts of giving your child over-the-counter medicine to help you through these winter months. Last winter was rough for us. I honestly don’t think that there were more than a handful of weeks in January and February that one of my kids wasn’t feeling under the weather. We seemed to cycle colds through the entire family and then in early February, the flu made it’s rounds. Let me tell you….during those two months I was exhausted with getting up at night to check fevers, spending all day nursing sick kiddos and even pushing through when I was under the weather myself. And I know I wasn’t alone in this struggle! After all, last year was the deadliest flu season in 40 years! That’s why I think it’s only normal right now that we’re all thinking about how to protect our family from germs as well as how to treat them when any member of our family gets sick this year. For me, as soon as a fever strikes, it’s my natural inclination to reach for over-the-counter medicine and begin to treat it immediately. Truthfully, most parents that I know have the exact same reaction. 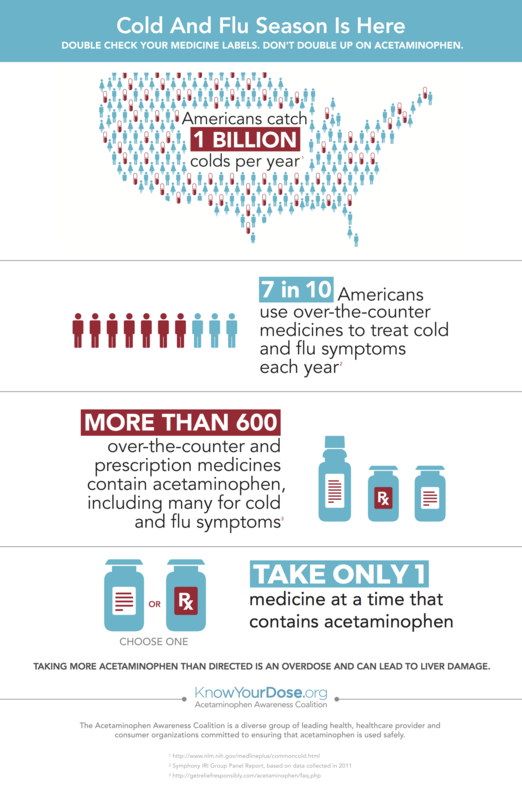 However, before you head for the medicine cabinet, remember that the Acetaminophen Awareness Coalition (AAC) is urging Americans to double check their medicine labels when treating cold and flu symptoms in order to avoid doubling up on acetaminophen. Why you ask? Well, research published this year shows that the chances of Americans taking more than the FDA-recommended maximum dose of 4,000 milligrams of acetaminophen in one day increases 24% during cold and flu season. This may be because people are feeling worse. It may be because more people are using over-the-counter medications to treat cold and flu symptoms at home. However, it’s important that you know the dos and don’ts of taking acetaminophen, both for yourself and your children. While these same dos and don’t apply to everyone in your family, I wanted to put an emphasis on how we treat our children with over-the-counter medications since as adults, we are completely responsible for what they put in their bodies. Before you start thinking that I’m saying stay away from over-the-counter medicines to treat the cold and flu, let me state that acetaminophen is safe and effective in treating pain and fever…when used as directed! There is no reason that you should avoid it’s use and in fact, I find that many times, acetaminophen is all my family needs to get through a nasty cold or a milder version of the flu. Since we’ve already established that acetaminophen is safe and effective in treating fever and pain when used as directed, it only makes sense that I keep it stocked in my home as an important tool when cold and flu season strikes. 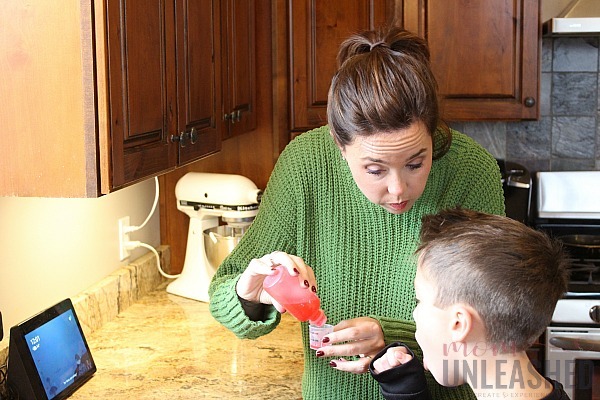 However, no matter how many time I administer acetaminophen to the boys, myself or my husband, I ALWAYS read the label and the dosing instructions. I know it’s easy to think that you’ve given or taken a certain medication a million times but just taking those few extra seconds to double check (especially when you’re exhausted from being up with a sick child or being sick yourself) your acetaminophen dose can make a huge difference! 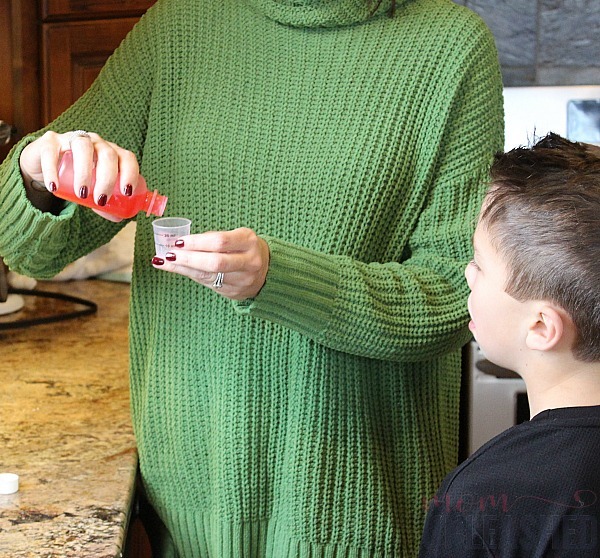 “Eyeballing” the amount of medicine you’re giving your child or taking yourself is NEVER a good idea, especially when using medicines that include acetaminophen. Taking more acetaminophen than directed can lead to liver damage so it’s extra important to not only dose correctly but to use measuring instruments that you can trust. 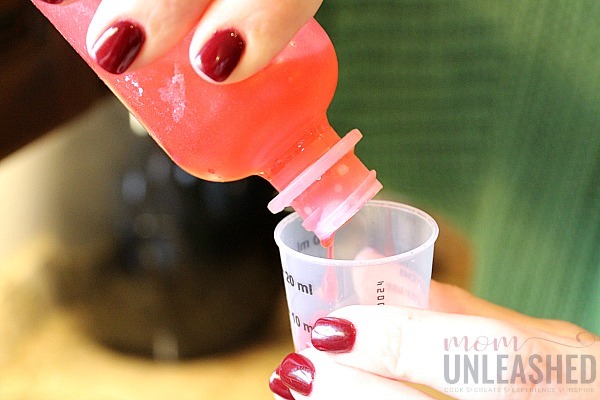 Most children’s medications come with a measuring cup. Use it every time! I recommend looking at the dosage, pouring your dose directly into the measuring cup (throw those cups away when the lines get faint from use) and then rechecking what you poured with the instructions on the medication. If I’m extra tired, I’ll even ask the hubs to double check behind me. It’s just a good safety practice that helps ensure I don’t make a mistake and give more acetaminophen than I intended to. When you or your child are sick, I know you’re looking for relief anywhere it can be found. I myself have been guilty of running out of one medication and switching to another. However, you should always read each and every label of EVERY medication you are taking or giving your child. Double check to make sure that you’re only administering one medicine at a time that contains acetaminophen. Again, this is something I sometimes have my hubby double check being me on because it can be easy to miss an ingredient if you’re not super careful. Another trick I’ve discovered is separating those medicines that contain acetaminophen from those that don’t in my medicine cabinet to make it easier to ensure I don’t double up on dosing. When your kids are sick, it’s all parents on deck. However, it’s so important to have one primary person administering medicine so that you don’t end up with mom giving some now and dad giving some in half an hour. If multiple people will be administering medicine, simply grab a notepad and leave it on the counter with times and dosages and make sure that anyone administering medicine containing acetaminophen checks it before every single dose. While dosage instructions are included on all medicines that include acetaminophen, don’t be afraid to call your doctor’s office or ask the pharmacist for any clarification you need. If you’re unsure of dosage or whether two medicines both include acetaminophen, simply ask your doctor or pharmacist BEFORE administering the medication. After all, it’s better to be safe than sorry! Any time any member of your family is sick, all you want to do is help them feel better fast but remember that taking that extra time to double check medicine labels so that you don’t actually double up on acetaminophen will help them now and in the future. For more information on acetaminophen and how it can be used to treat a cold or the flu, be sure to click here. 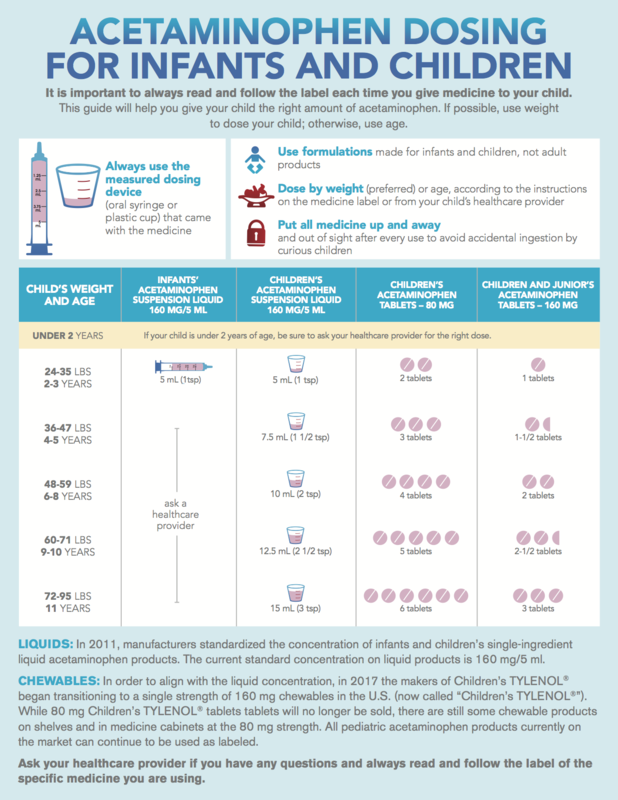 And if you’re giving your child over-the-counter medicine, bookmark this important information on administering acetaminophen to infants and children. Then always remember that when you, your child or any member of your family is feeling under the weather, it’s important to know your dose and follow the dos and don’t of administering acetaminophen each and every time. Now tell me, do you have acetaminophen containing products in your home for treating cold and the flu? These are all such wonderful tips and I like how you emphasized using the correct dosage and reading labels. My daughter-in-law is a pharmacist so when in doubt, I give her a call. We just had a cold move through everyone in the house and used up so many tissues. I will keep this in mind when I use acetominophen products. This information is so important tips to know and keep on hand. I have a friend who’s a pharmacist so I always contact her when I have questions. We have one kid with only one kidney, and we limit the use of any over the counter medicine to only when absolutely necessary. These are good tips. Great tips! I opt for natural remedies but when we have to take OTC 1st thing is READ the label and use according to directions. This is good to keep in mind. I hate when my kids are sick, but I never give them more medicine than they should have. It’s so important to pay attention to all the details when it comes to medications. I always check the label and re-read everything. My kids are growing up so fast and the dosages are always changing. These are great tips to be mindful of during cold and flu season. We have a pharmacist in the family, so we know how important it is to use medications including acetaminophen safely. These are great tips. Making sure not to double up on acetaminophen is very important and having one person handling the dosing helps with that. Great post! Thanks for sharing. These are great tips. It’s important to make sure that you are always using OTC medications safely. After many, many visits to our pediatrician and the ER, when my oldest was small, we finally figured out how to deal with otc meds. As a mom of two kids who have BOTH been sick over the last two weeks, this definitely rings true for me! I am always SO careful with acetaminophen. I remember when the news came out about it a few years ago–I couldn’t believe how scary it can be if you give even a little too much! I also write down every dose I give JUST IN CASE I forget. Better safe than sorry. We buy OTC meds most of the times but we make sure that it is safe for the kids. Thank you for these tips. Great tips! I’ll like to add that parents/caregivers should not be afraid to ask for help if they are unsure about dosing or use of over the counter medicines. Most retail stores have a pharmacy and pharmacist. So it costs you nothing to ask fore help or recommendations. Parents have to be so cautious about this, too much is so harmful and we don’t even know it. Thanks for sharing. I will be more careful with the medicines label. Thanks for sharing these information with us! I know for a while Tylenol had magnets for dosages that you could put on the fridge. It was really helpful.